Borussia Dortmund third kit for the 2017-18 season has taken the form an iconic feature – a shirt for the fans. And while the shorts and the socks are simply white with gray/black finish, the jersey definitely grabs attention. Like the rest of Dortmund’s kit, the third jersey is made by Puma – the club’s official apparel manufacturer. It introduces a simplistic design in heather gray with white stripes running along the shoulders to the hems of the sleves. Black Puma cat adorns the right breast, while the BVB logo stands out prominently over the heart offering the only dash of colour. The jersey is made of highly functional material which channels sweat away from the body and features underarm mesh gussets for better ventilation. It is made with the proprietary Puma dryCELL garment technology and contains 100% polyester. Borussia identity in streetwear – a great concept! 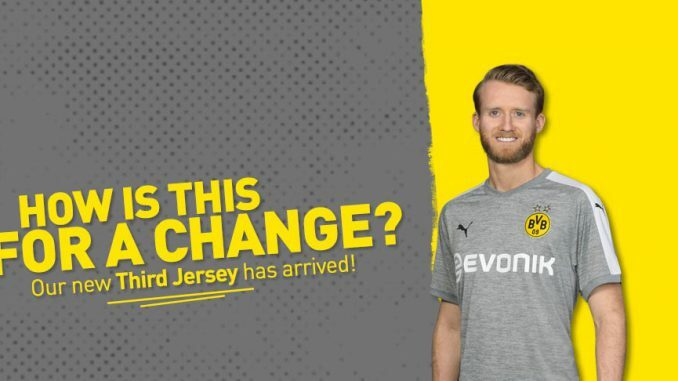 As a pitch alternative to the usual Borussia yellow the shirt offers very little, but this jersey was made for the fans and that is where it truly shines. It one word, it’s fashionable. The design may be simple but it’s attractive and the hue of the gray goes with virtually any other apparel in one’s wardrobe. The embellishments complement the design but don’t detract from the very eye-catching logo which by the virtue of being highly noticeable in yellow stands out from afar. And that is precisely what we want. This is one shirt that is not going to become obsolete at the end of the season, as it can be worn as a t-shirt for years to come allowing fans to proudly display their Borussia allegiance in both comfort and style. Among all the club’s merchandise not only does this jersey fit in the category of casual wear that supporters like, but it has the additional distinction of actually being worn on the pitch. It’s a true shirt for the fans and it has lasting appeal. If you are a Borussia fan, this shirt is a gem. It has a long lasting appeal. For this and other BVB jerseys check out Subside Sports. For other Borussia fan merchandise, check here. Let us know what you think about the new Borussia Dortmund apparel, specifically their design choice for their third 17-18 jersey. This looks like a pretty, good shirt, and Puma really knows how to make quality apparel. This shirt has a lot of demand, I checked your link to see If I could buy one but my size is out of stock, there are only S and XL available. I will check some other time again. Indeed, it’s a new and popular shirt so it’s in quite the demand. The sizes will be restocked very soon though, so there shouldn’t be any further problems. I am a get in the shop look at what looks nice and buy that kind of a guy. Then I landed on your website and found this page. Then you tell me about functional material, underarm mesh gussets, dryCELL garment technology and everything I thought I knew about clothes was smashed. Haha! It’s amazing what goes into making football uniforms these days. I never look at a garment the same way anymore. I am more of a baseball and American football kind of girl, but I have been to a Revolution Soccer game before and I can appreciate the sport. I definitely couldn’t play it, that’s for sure. I really do love the look of this shirt though. It’s simple, but attractive and I think it would be great to workout in. The dryCELL technology and the underarm mesh gussets sound like they would be great for exercising. I may just have to pick one up for the gym.